What is an Automatic Generator Start and why we should use it. What is a generator remote start circuit. The main function of a Generator Auto Start Module is to automatically start & stop a generator. This is accomplished by following our generator auto start circuit diagram in the first place. Then, you are required to set up parameters like a scheduler or to configure inputs connected to level switches, pressure switches, climate control systems, mains failure detection relays or other. The Be124 Generator Auto Start Module, for example, can automatically start the engine when battery is low. It will automatically stop the engine after a programmable time or when the battery are full charged. When the generator is working and the engine is running, the Generator Auto Start Module protects the entire system. You are required to correctly program parameters and settings. If the engine temperature exceeds the limit, the Generator Auto Start Module will prevent a damage by shutting down the engine. 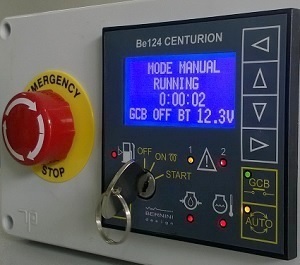 The Be124 Generator Auto Start Module features a serial interface that allows you to remotely control and monitor the generator. You can use a mobile phone via GSM communication, Internet via TCP-IP protocol or you can use the serial interface RS485 via the MODBUS-RTU protocol. You will understand all details by analyzing the generator auto start circuit diagram shown for each controller. In this Be124 generator auto start circuit diagram you can see how simple is to make a generator auto start module by adding only two automotive relays. You can connect the remote start diesel generator module to digital or analogue sensors. By using the Be124 you can make a high tech auto start panel by following this simple generator auto start circuit diagram. Click on the image to enlarge the diagram. To add remote start to generator is a simple task. This kit will allow you to make a GSM-BASED generator Auto-Start control panel. You are required to connect 2 relays and the sensors to protect the engine. If available on your engine you can wire the pickup as well. The Be1 monitors the generator voltage up to 600VAC. - one digital input (optional) to monitor a magnetic Pick-up. It is preferable a Generator Auto Start Module with static & short circuit proof outputs. External relays could be placed in proximity of the engine or generator. Automotive Plug-In relays are always preferable. In case of damage you can replace the relay (it is really easy to find automotive relays in a shop for auto parts & accessories). A Bernini Design Generator Auto Start Module works in a range of about -20 up to plus 70 degree Celsius. The electronic circuitry is designed to work in between 5Vdc up to 33Vdc and able to survive in case of total battery loos for about one second. A Bernini Design Generator Auto Start Module provides high resistance to fatigue due to the key start. START DELAY TIME >It provides a programmable delay after detecting a start condition request on a programmable input (or serial interface). STOP DELAY TIME >It provides a programmable delay after detecting a stop condition request on a programmable input (or serial interface). PRE-LUBE TIME >It energizes the Pre-lube pump or simply it could be used to delay the crank if necessary. PRE-GLOW TIME >It energizes the Pre-glow of the diesel engine. PRE-GLOW MODE >It allows you to choose the best pre-glow logic . CHOKE TIME >It energizes the Choke of gasoline engine for a programmed time. CRANK VDC >It terminates the crank when voltage of the charger alternator rises above the setting. The option OFF disables the monitoring. CRANK VAC >It terminates the crank when voltage of the generator rises above the setting. The option OFF disables the monitoring. CRANK TIME >It limits the coupling of the starter motor. 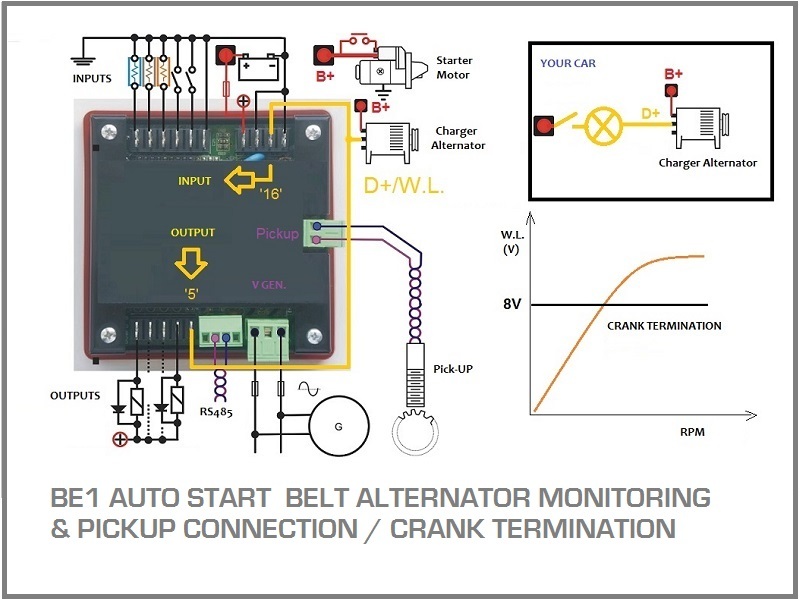 CRANK REST TIME >It creates a delay after each starting pulse in a way to stabilize the parameters of the battery. In the same time it cools down the starting motor. START ATTEMPTS >It limits the numbers of attempts before providing a starting failure alarm. CRANK HZ > It terminates the crank when frequency of the generator rises above the setting. The option OFF disables the monitoring. CRANK RPM > It terminates the crank when the rotational speed of the engine rises above the setting. The option OFF disables the monitoring. The above parameters are normally 'factory defined', but a Bernini Design Generator Auto Start module will let you full access to the settings. You can adapt the AGS to any style of engine and generator. Follow these links to see the list of all adjustable parameters! Understanding a generator remote start circuit. In this explanation we use the Be1 Auto Start Module. The principle is the same using Be124 and Be24. When the engine is not running, the voltage of the terminal D+/WL (yellow wire) of the charger alternator is closer to zero volt (0V). As soon as the Be1 starts the engine, a voltage appears in the D+/WL terminal (0,8 to 2,5V). This is due to the exciting current that flows into D+/WL from the Be1 alternator excitement circuit. When the engine starts running, the voltage of the D+/WL terminal increases by up to 3V-6V. This usually happens around 500 up to 800 RPM. When the engine runs at nominal speed (1500 RPM for example), the D+/WL voltage reaches the 14V (or 28V in case of 24V system) needed to charge the battery. The safest point to disconnect the starter motor is between 6V to 10V (500-800 R.P.M). The default parameter of [P24], or factory setting if you will, is 8.0V. Make sure that the green ‘START-ON’ LED on the front panel is off during the all starting attempts.The Be1 can display the charger alternator voltage (see section 3.0 of the User Manual). The value of it can help you in troubleshooting a problem of the charger alternator. The Be1 also uses the speed measurement (RPM), Alternator voltage (V generator) and Generator frequency (Hz) to terminate the crank. The user manual explains all details. This is the case of gasoline engines or some the case of small size diesel engines. 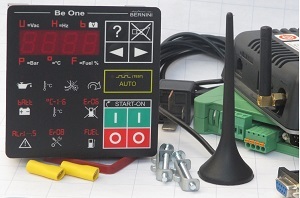 The Be1 controller features DC and AC inputs to monitor the charger alternator. A gasoline engine is not fitted with a belt driven charger alternator (does not exist the D+/W.L. terminal) because it uses a flywheel generator that provides an AC voltage. We recommend that you disable the [P25] ( [P25]=OFF). This prevent the Be1 to monitor the 'BROKEN BELT’ alarm. Connect the floating charger wires directly to terminals 15 & 16 of the Be1. You cannot monitor a FLYWHEEL GENERATOR using BE24 or BE124 except the case when the engine is fitted with a charger regulator that provides the W.L. simulator terminal (normally suitable to drive a lamp). In case of a flywheel charger generator (this is normally the case with gasoline engines), the reading of the charger voltage is not accurate. The [P24] setting, in this case, expresses only a proportional factor. As a matter of fact the voltage is alternate, it is not stable, and the frequency depends on the kind of engine. Be1 is able to detect the proper moment to disconnect the crank. You are requested to change the setting from 8V , down to 5V or 6V if necessary. You have to find the correct setting. The Be1 user manual will guide you via a step-by-step procedure. Bernini Design offers the best generator auto start circuit diagram suitable for your application. If your business is about small up to medium size gasoline generators we recommend that you use the Be1 generator auto start module. The generator auto start circuit diagram about it is really simple and intuitive. 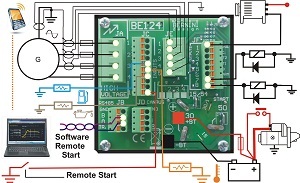 You can connect the Be1 module to an external controller, for example an Automatic Mains Failure module or Automatic Transfer Switch. If you business is about industrial application of heavy duty application you may use the Be24. It is suitable for a diesel engine. It features a strong key start module. This controller is extremely user-friendly. You can feel like using your car. But if you are looking for the best generator auto start module you have to use the Be124 controller. It provides all kind of functions including oscilloscope and data logger.